This is the year you finally stick to your New Year's resolution — I can feel it! 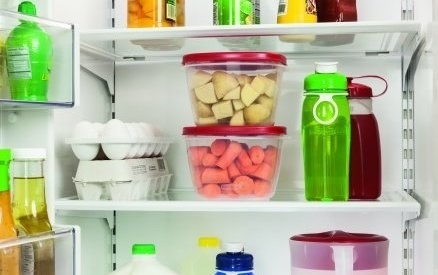 Is this the year you've decided to get eat healthier? Same! I believe in us — we can stick to our goal this year with the help of the right resources (and the willpower of Michelle Obama). 1. A spiralizer that will transform a typically carb-filled dinner into a veggie-filled one with just the turn of a handle. All you have to do is insert your fave vegetable and turn the handle to create tasty veggie noodles. It's so easy even the laziest of cooks can enjoy it. 2. A colorful measuring cup and spoon set, so you can add the correctly portioned amount of oats into your overnight oats (aka your new-and-improved breakfast). One of the ways I worked on improving my diet when prepping for my wedding was by making overnight oats every Sunday night for the upcoming workweek. It made me less likely to buy a bagel or pastry on my way into the office. Make sure you're actually making it a healthy meal by using these measuring cups to add the correct amount of each ingredient into the mix. 3. An oil-less fryer that's all the rage right now, perfect for anyone with limited time who wants to cook healthier meals faster. Air-frying is having a moment right now. It's all my mom can talk about (that and the fact my chef of a dad feels they absolutely do not need one). If you're not familiar with this product, all you need to know is that it can bake, grill, fry, and roast meals up to 30% faster, and with a fraction of the oil you'd otherwise use. Pretty freakin' incredible. Any lazy chef needs one of these in their kitchen. Promising review: "This air fryer surprises me daily. The basket (3.5-quart) is a good size for a family-size portion of whatever you're air-frying. The basket and casing are metal as is the inside of the machine. The front panel is all digital and very nice, it really works amazingly. I love that they add a handy cookbook with this product, and the cleanup is easy. The inside basket has a release button so you can pop it out to clean it. The basket and casing are nonstick as well, easy cleanup. Two thumbs up!! It's a mini oven without wasting energy and time using a standard oven." —$49.99. 4. A 30-piece set of nonstick pots and pans, because every chef deserves the encouragement that comes along with fancy new cookware. If you've already committed to eating differently in 2019, you deserve a reward! Treat yourself to a brand-new set of pots and pans. This set comes in stylish colors that will brighten up any kitchen and includes a number of features that make it worth the purchase. The cookware has a nonstick diamond reinforced coating, heavy-gauge forged aluminum for optimum heat distribution, and silicone handles and knobs (just to name a few). It also comes with a Google Home Mini to help guide your through your favorite recipes. 5. A handy leaf-shaped gadget that is so efficient in stripping leaves from their stems it'll make you say "oh, kale no!" because it just works THAT well. *Said in whiney voice* I want to be eat more vegetables but prepping them is just sooooo hard. You know what I meaaaan? Well, now we can add kale and other leafy herbs into our recipes seamlessly by using this lil' gadget to strip them from their stems in record timing. Huzzah! Get it from Walmart for $3.92. 6. A NutriBullet, so even if your resolution feels slightly overambitious you can at least prepare fresh smoothies in the morning. With the new year creeping up on us, your may have started rambling on about incorporating more smoothies into your diet. Whether you're looking to make fruity mixtures or chop up veggies, this NutriBullet has you covered. Get it from Walmart for $79. 7. And a book filled with smoothie recipes, to give you some inspiration for those morning blends. I don't know about you, but I'll take all the guidance I can when it comes to trying new things in the kitchen. This book, Green Kitchen Smoothies: Healthy and Colorful Smoothies for Every Day, seems like a great place to start for 2019. Get it from Walmart for $13.59. 8. A 13-piece super slicer that will change the way you meal-prep forever. Ready to change your cooking life? This one kitchen accessory can grate, slice, clean greens, separate yolks, julienne veggies, and so much more! Get it from Walmart for $10.97. 9. A mini herb saver, because it's about ~thyme~ we all grow our own seasonings. My husband recently started growing a variety of spices in our kitchen (think thyme, basil, mint, etc.) and has since begun placing them in the fridge in plastic bags. If you're living with a similar scenario or want to start growing and saving spices yourself, you need this mini herb saver. It's small enough to keep in the fridge door and it protects the herbs from getting crushed. Get it from Walmart for $9.86. 10. A Cuisinart Griddler, on which even a wannabe healthy chef like yourself can make delicious grilled chicken without having to purchase it pre-made. Using the Griddler is so simple a monkey could probably do it. Throw your chicken on, close the double grill pans, and BOOM — dinner is served. This product is perfect for those of us with small apartments (and therefore small kitchens). I'm not sure what I would do without mine! 11. A handheld grater to shred potatoes or zucchini for more veggie-filled (but still delicious) recipes. Get it from BuzzFeed's Tasty collection for Walmart for $6.24+ (available in four colors). 12. An electric tea kettle so you can whip up a serving of green tea so fast even Queen Elizabeth II would approve. If you're anything like me, you hate waiting for water to boil, especially when it's for a beverage. I have one of these electric kettles and it has truly become my favorite kitchen appliance. With a click of a button your water will be roaring and ready to go. 13. Or an apple corer to assist you in flawlessly dividing your fruit into eight pieces without utilizing ANY knife skills if you're hesitant. In an attempt to cut down on eating sweets before bed, I've swapped out desserts with an apple and peanut butter. Thanks to this handy tool, I can dice up this juicy fruit in under 30 seconds for a delicious snack, no accidental knife cuts included. 14. A nonstick muffin pan, so you can meal-prep a variety of yummy mini-quiches (or whatever mini things your heart desires)! Another delightful meal-prep idea? Mini-quiches! They're super easy to make, but it's essential that you have a good, nonstick muffin tin to bake them in. I used a crappy old one and, while my lil' breakfast bites popped right out, the residue of the egg WOULD.NOT.BUDGE. Don't make my mistake — get this fab non-stick set. Get a set of two from BuzzFeed's Tasty collection for Walmart for $12.99. 15. A 4-in-1 chopper that can slice, dice, and chop with just one motion — essential for anyone who's tired of cleaning cutting boards after meal-prepping. I always plan to meal-prep for the week, but then life gets in the way and I'm stuck emptying a can of soup into a container and calling it a day. With an easy-to-use gadget like this one, I (and you) can cut up tons of veggies and fruits with the most minimal effort for meals all week long! So long, excuses. Get it from Walmart for $12.17. 16. 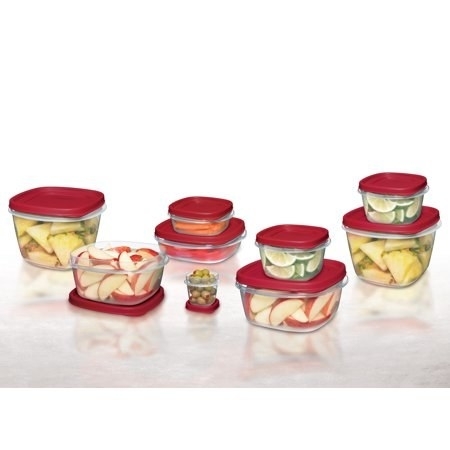 A 24-piece set of storage containers that will guarantee you'll have more than enough ways to save the leftovers of the fantastic meals you'll be making. Get the set of 24 from Walmart for $8.50. 17. A vibrant set of silicone utensils, so you can ~stir-up~ some fun in the kitchen in 2019. Add a pop or color to your kitchen counter by throwing these silicone utensils into the mix! The set comes with a soup ladle, a solid spoon, a slotted turner, and a solid turner. You'll be ready for any recipe that gets thrown your way this year, that's for sure. 18. An avocado slicer and pitter that will help you quickly prep guac or add slices of 'cado to your salad faster than you can say "Holy guacamole!" 19. A two-piece strainer set, so you can rinse off a delicious bundle of grapes or some strawberries for a snack without any hassle. Get a set of two from BuzzFeed's Tasty collection for Walmart for $12.44 (available in two styles). 20. And a Crock-Pot that will literally do all the cooking for you. You're welcome. Never, and I mean NEVER, underestimate the power of a good Crock-Pot. This specific one is dishwasher-safe (yes! ), has removable oval stoneware that doubles as a serving dish and a convenient warm setting, and makes enough food to feed nine people. You, making healthy choices all throughout 2019 (or at least in January).